The only new economic data worth mentioning this morning is a report from Challenger, Gray & Christmas, which showed that 36,957 corporate layoffs were announced in America in February. That is a 19 percent decline from the prior month and 40 percent below the number of separations seen in February 2016. Further, 82,891 job cuts have been announced year-to-date, a significant improvement from the 136,713 corporate layoffs that occurred during the first two months of 2016. A big factor behind this decline is the rebound in the price of oil, which has resulted in an 87 percent drop in energy sector layoffs compared to this same period last year. John A. Challenger, chief executive officer of Challenger, Gray & Christmas, added that “The energy sector announced over 107,000 jobs last year. It seems the bleeding has stopped for now. 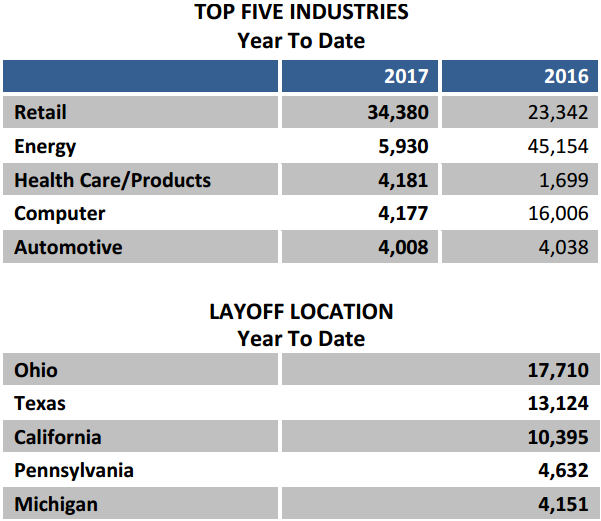 The new administration and EPA chief Scott Pruitt have already enacted legislation to aid oil and gas companies, but it remains to be seen if those actions will result in more jobs.” With the crisis apparently over in the energy arena, the retail sector has become the main driver of job cuts in the early part of 2017, as expected following the holiday-shopping season. There was also a notable uptick in finance industry layoffs in February, along with a largely offsetting spike in hiring that Mr. Challenger attributed to the “shift to digital, which while causing job loss is also creating jobs.” Moreover, employment in general has firmed recently, with employers having announced plans to hire 162,266 workers during the past two months, the best January-February hiring total on record.